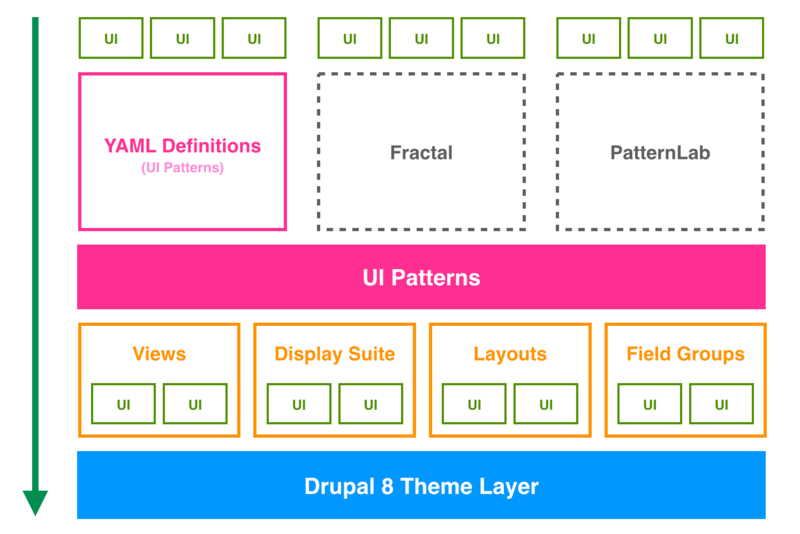 The UI Patterns module allows developers to define self-contained UI patterns as Drupal plugins and use them seamlessly in their panels, field groups or Display Suite view modes. UI Patterns: the main module, it exposes the UI Patterns system APIs and it does not do much more than that. UI Patterns Field Group: allows to use patterns to format field groups provided by the Field group module. UI Patterns Layouts: allows to use patterns as layouts. This allows patterns to be used on Display Suite view modes or on panels out of the box. UI Patterns Display Suite: allows to use patterns to format Display Suite field templates. UI Patterns Views: allows to use patterns as Views row templates. By the way plugin definitions are handled the UI Patterns module also integrates with with tools like PatternLab or modules like Component Libraries. Download and install the Bootstrap Patterns theme on a vanilla Drupal 8 installation to quickly try out the UI Patterns module. © Copyright 2017, Nuvole Web Revision 17e15963.